Ciao from Roma, or more specifically, Loyola’s John Felice Rome Center! I have been here not even two weeks, but I have already had some great times and seen some of the great sites. It all started on the very first night. We all arrived at some point on Saturday, May 14. We all moved in and got settled and at orientation learned about “Notte dei Musei”, meaning that for that one night, and one night only, would all museums (excluding the Colosseum) be free! So, jet-lagged though we all were, we went out to experience Rome and see some museums. A group of us from the JFRC found ourselves at the Piazza Navona, and stumbled into the Musei dei Roma there. All was beautiful and I had my first gelato! Sunday was our beach day, which sadly was rained out. 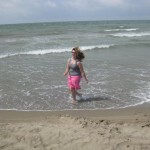 I still, however, got the chance to dip my feet in the Tyrrhenian Sea! Later that week, my roommate and I decided to go be tourists and see the “Piazza de Spagna” (Spanish Steps) and “Fontana di Trevi” (Trevi Fountain). 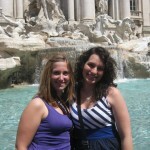 My roommate deserves a shout out for using her two semesters of Italian to successfully ask for directions, in Italian! (Even if they answered in half English). The Trevi Fountain is probably one of my favorite places in Rome so far, it really is unbelievably beautiful. We tried to eat our Calzones by the fountain, but apparently that’s not allowed. We came upon this knowledge when a security guard came over to us and literally waggled her finger at our food. No problem though, they were just as delicious on a bench down the way! We also experienced our first Fr. Bosco tour. Fr. Bosco leads little tours of whoever wants to go twice a week. These tours involve jogging to keep up with his walking pace, lots of churches, and a gelato stop for each tour. Gelato is a key part for Fr. Bosco, he has list of his top seven gelato places and insists on having gelato everyday in Rome. When in Rome, I say! And all of this in the first week!